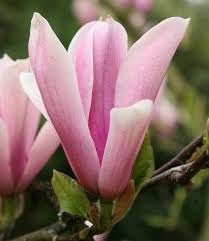 A magnificent, low maintenance, vigorous, dark leaved, deciduous, small to medium sized magnolia tree, Heaven Scent (Magnolia 'Heaven Scent') has the most sublime pink flowers in April and May with a magenta stripe at the base. A richly scented magnolia, this is one of the finest of the ‘Gresham Hybrids'. Magnolia Heaven Scent is UK frost hardy down to H5 which is "Jibber Jabber" to mean resistant to frost at minus fifteen degrees Centigrade, 5 degrees Fahrenheit, 257 degrees Kelvin or similar to your chest freezer. If you do not relate to any of those temperatures then it is usually the sort of cold that when you open the door to go to work, you change your mind and call in sick. The Magnolia Heaven Scent is such a fantastic tree that the RHS decided to give it an Award Of Garden Merit. For those not in the know, this is where a panel of gardening experts sit around a table and argue which is the best examples of what plant. There is no red carpet ceremony and news stations do not interrupt their broadcasting schedule to tell you this, but to some the award is significant enough to influence their buying decision. Plant in full sun or partial shade and by that we are describing the spot it will remain in, not the weather on the day! (we do get asked) Expect better results in a sheltered position. 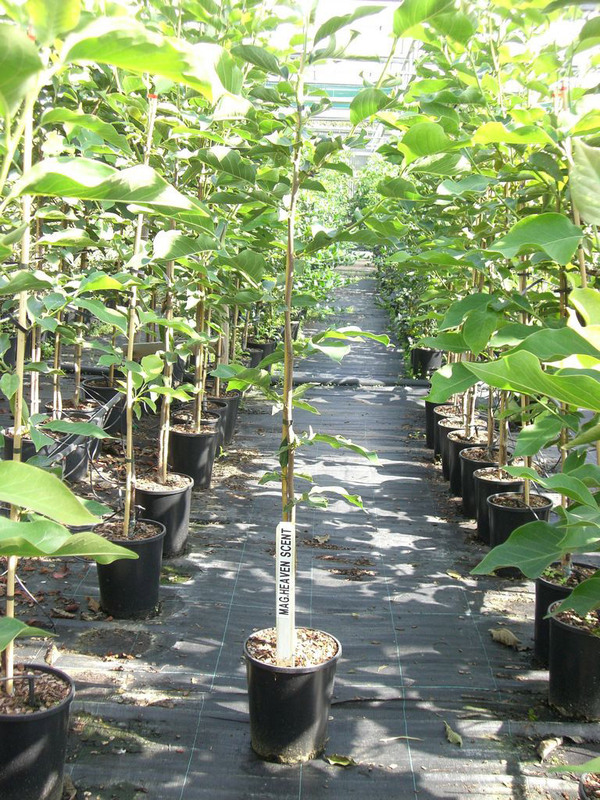 The Magnolia Heaven Scent will tolerate loam, clay and sand with moist well draining soil. If you have ducks floating on your lawn, you do not have well draining soil. As for acidity, Acid to Neutral is preferred. So if you give your Heaven Scent a customer satisfaction survey to fill in and you planted it in chalk, expect low marks. A small height tree/shrub, so expect a height of up to 4 metres (13 foot) after 10 years. It could go on to be more than twice that height but this is weather and local conditions dependant. As for spread, like most of us in middle age it will increase. You could be looking at more than 8 metres, the tree that is, not you personally. 10 Litre Pot 2-3 years old, 90-150cm and will be a bush shape. 15 Litre Pot 3-4 years old and will be bush shaped. This means there will be multiple stems coming off the main trunk and they start very low down. Supplied at a height of 100-150cm. If only one of the options are showing then this is on purpose to confuse you. This is because we have a naughty streak and too much time on our hands. Alternatively, it could be that we have run out of that range. Should be you be confused by any of the above explanations then buy the most expensive one because we make more profit on those. Suitable for container growing but water and nutritional needs increase considerably, especially in Mid-Summer. As a general rule, in full sun, a 12 Litre pot can dry out in a day, whereas as a 100 litre pot can remain moist for 4 days, especially with a mulch layer. Best to prune the Heaven Scent in mid-summer to early Autumn. A light pruning will encourage new growth and removing dead, diseased or crossing over branches is always advised. 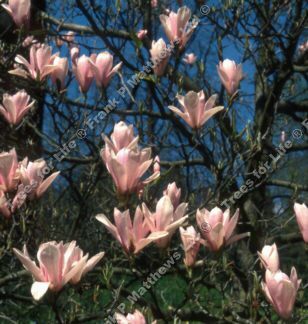 Heavy pruning a mature Magnolia Heaven Scent can produce watershoots which are long, vertical and very vigorous shoots and not desirable. If heavy pruning is required to shape the tree, best to space this out over several years and aim for an open centred tree.